Mealworms have been consumed by humans for thousands of years, and there are many good reasons to give them a try. My own thoughts on the matter are that I strongly endorse Entomophagy as a way of life, and am in no doubt that future generations will not think twice about insects derived fats and protein as a part of the standard diet – particularly for those of us with Western lifestyles (and attitudes). But for now it is quite the taboo, this eating insects thing. It comes up every now and again in places like the UN’s Food and Agricultural Organization, which gets a heap of publicity in the mass media for a week or two then goes away. Very few people that I discuss this with actually take me up on it, and give them a try – even when they agree with the reasons why. This article is all about the practical aspects of preparing, cooking, and eating mealworms. The information is based on my own personal experiences, starting in 2011. So this will complete the two part series – how to eat them correctly, following on from how NOT to eat them. I will include references to the academic literature where required, and I’d encourage you to do your own research on the matter if at all in doubt. How you go about farming mealworms for consumption will be covered in great detail for a future post, so for now just sit back and prepare to try something completely different, and hopefully not unpleasant. The Darkling beetle remains in the larvae form for up to 90 days, so what you are looking for are mealworms more or less of the size and vigour as in the video below. As in the video, get the quantity of mealworms you want into a paper or plastic cup and cover them over with a breathable lid, even some newspaper with an elastic to keep it firmly in place will do. 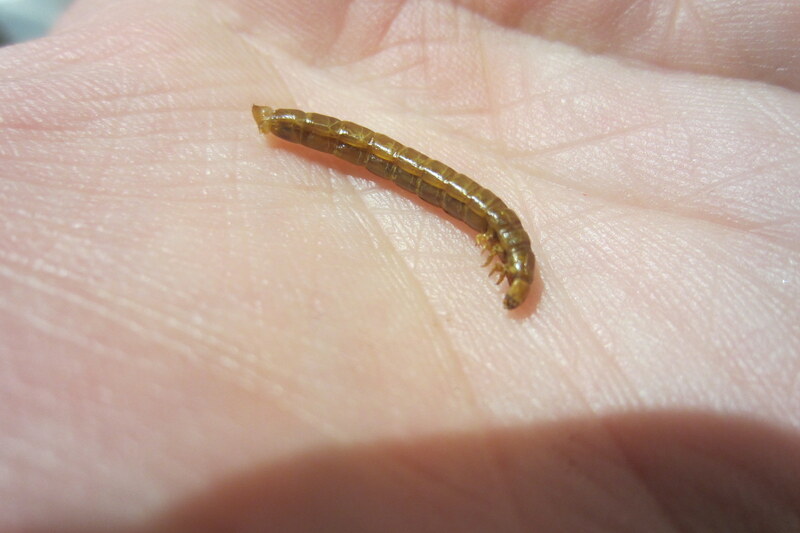 Remove any mealworms that are not moving, damaged, or transitioning to the pupal stage. Now according to some Online sources, you don’t need to purge the mealworms before you eat them, but if I’m going to clean my shrimp (prawns), then the same goes here. Additionally, some of the literature calls this out as a fairly standard practice from Africa to Australia (FAO 2010). 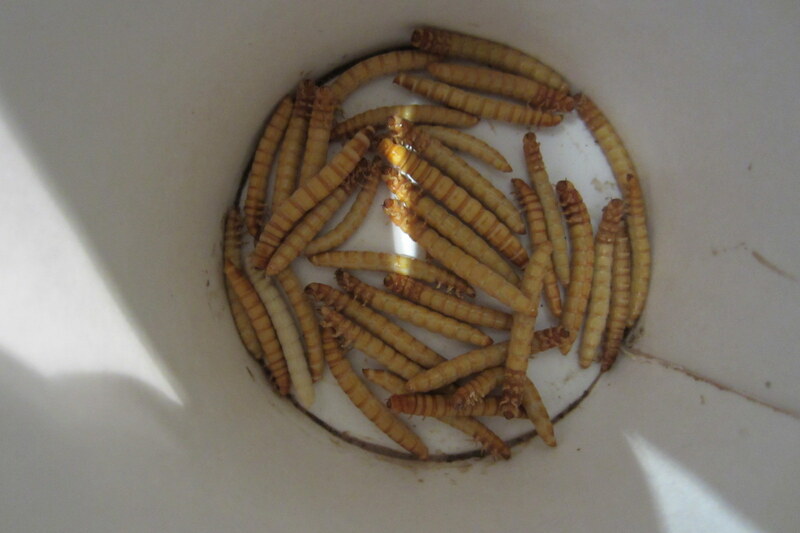 Leave your cup of mealworms in the cupboard for a day or two, making sure they have zero food with them. At this stage they are ready to go (jump to step 3 below), but if you want you could also try to flavour your mealworms prior to cooking – add in a couple of small apple pieces, carrot, crushed cinnamon sticks, parsley, and so on. What you get from doing that is the flavour of that food going into the mealworms. As they eat it they start to taste like it, just in the same way that beef, lamb, and pork can be affected by diet. I’d suggest you avoid any citrus and overly watery foods – things like watermelon won’t work. All that liquid disagrees with them in a big way, and after a couple of days it will make them dead and therefore, inedible. I lost a few batches just by having too much orange mush in the cup with them. My own favourite is cinnamon, so if you are unsure then start with that. If you do flavour your mealworms, keep them eating it for 2-3 days, then remove all food for a day or two. Put your mealworms into the freezer for 1-2 days at a temperature of -10° to -20° Celsius (0° Fahrenheit). 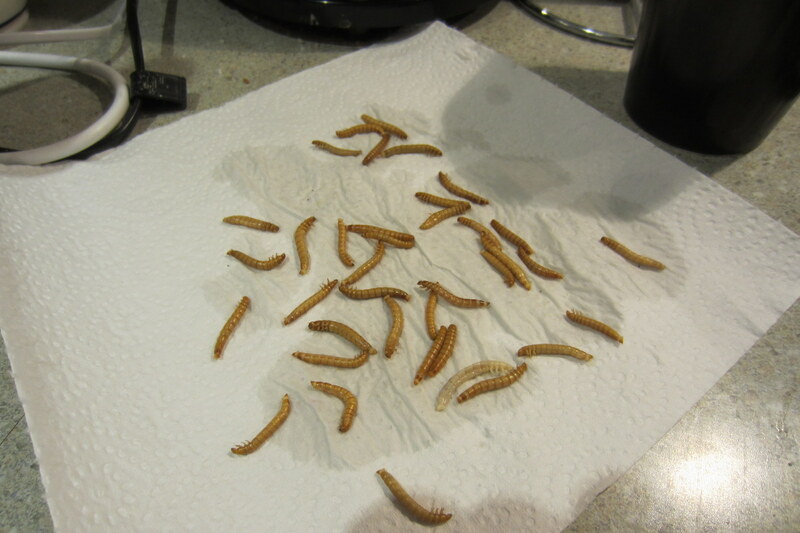 There are some articles out there suggesting 15 minutes, but I can assure you that mealworms are very well adapted to shutting down (but not dying) in cold temperatures, in fact one way to prolong their larvae form is to put them into the fridge for months at a time. I once had them in the freezer for 8 hours and after 30 minutes at room temperature were all back like nothing had happened! This step will ensure that the mealworms naturally shut down and remain in that state for long enough that any chance of returning have gone. It seems a little cruel until you consider how we dispatch some of the other animals we use for food. Insects might not feel pain as we know it (further reading with Smith 1991, DeGrazia & Rowan 1991, Gherardi 2009), but we should handle them as if they do. You can leave those frozen mealworms for up to two months in the freezer, and if you plan on freezing them in batches then make sure to date the containers so you know what’s what. After a couple of months they will still be OK for the compost, for fish, or the chooks. And make sure you keep a lid on whatever container you use to avoid freezer burn. This is what mealworms look like when frozen. Now let’s cook them! The first step here is to boil your frozen mealworms, to ensure they are clean of dirt or potential parasites (such as described in Omoto & Cartwright 2003). Keep them in the boiling water for 3 minutes, then drain out on a napkin or cloth. You can then go on and use the water in the compost bin, as it will have taken enough nutrients to still be useful. Pat them dry and remove any mealworms that are obviously damaged or discolored. This is a very easy way to cook mealworms and they taste great also. If you have yet to try a dehydrator, they can be used for plenty more things than preparing insects – drying fruits, vegetables, nuts, meat, ETC. 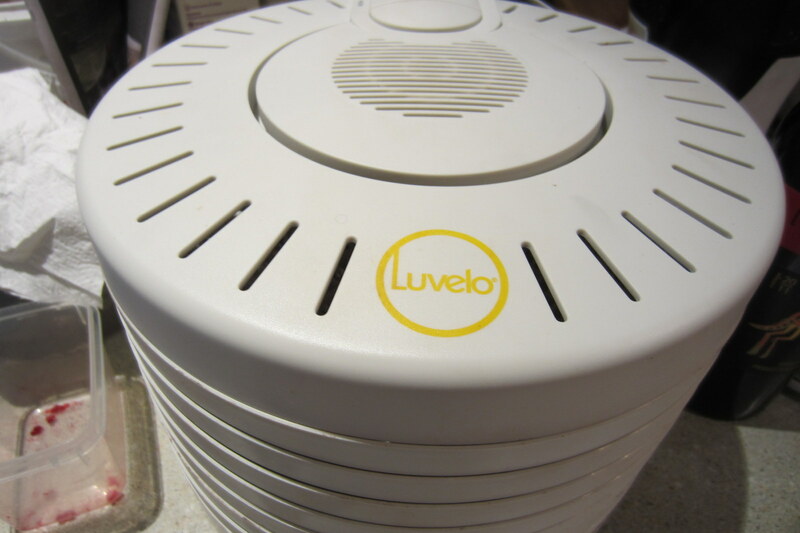 If you don’t own a dehydrator, you can substitute the oven grill just as easily – just keep the heat to about 50°C (122°F). When they look something like this they are ready to eat. Remove the head and legs if it helps (it did for me), but after a while it didn’t make any difference. This is a recipe for mealworms that results in a lovely snack. I like to add salt at the end because it makes the whole thing feel like eating little roasted peanuts. Keep a close eye on those mealworms as they cook – if they start to pop then turn down the heat. I’d suggest you sample one before finishing up, because their taste will change depending on how cooked they get. My own preference is to leave them on until crispy. This mealworms are glazed just right, so eat one or all. This is more about flavoring mealworms than cooking them. Kind of like the thing you can do by adding cinnamon and so on during the purging phase. The following preparation makes for an effective marinade, and is one I’ve used on many occasions. So Where to Get that Next Meal? So folks thanks for getting to the end! I hope you are thinking long and hard about Entomophagy and mealworms in particular. You can raise and make them into a meal all from your own home; they taste good, and are nutritionally excellent. There are plenty of recipes out there if you take a look, as more and more people get curious enough to give it a go and share their experience. Bon appétit, and If you have any questions feel free to ask in the comments sections below. 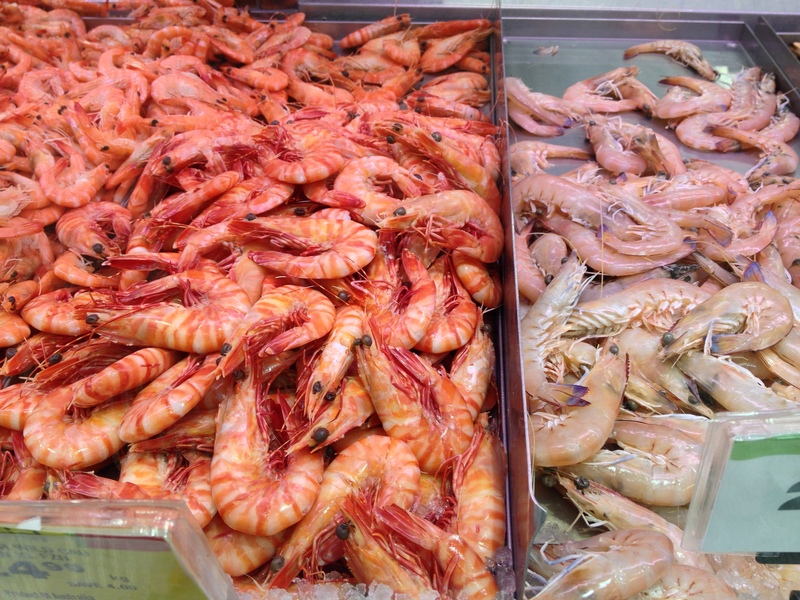 Shrimp are related to Mealworms – are they really that much different in your eyes? Tags: eat, human consumption, Mealworm, prepare, recipes. Bookmark the permalink. Interesting read, veru informative. I’ll be giving some mealworms a try soon. Excellent please do! Let us know how it goes. Hi Shane! I was doing a bit of reasearch and was wondering if I wanted to supply myself daily with 200 grams of mealworms a day how may mealworms would i need to start with ? How much place would it take? Hello, I wonder at what stage you can ground them into flour for baking? Looking into starting a farm in Peru. As soon as they are completely dry, you could ground them into a flour. Is this a new business for you? Please tell me more about your plans! Is there any danger of buying freeze-dried mealworms for birds or pets and eating them yourself? I read somewhere about getting salmonella that way or something….scary. Yeah that would be something to avoid. Heaven knows what the conditions are like when they are doing that! Best advice – do it yourself or from a place you know and trust. Just a comment about mealworms being related to shrimp. I fail to see the connection. Mealworms are insects and shrimp are crustaceans. Otherwise I found your article interesting as my son is quite intrigued with the idea of trying to eat mealworms. Your ideas and those of your readers will come in very handy as we try this new family adventure. Maybe – I was just going by what I read on Wikipedia. Despite the name, shellfish are not a kind of fish, but are simply water-dwelling animals. Many varieties of shellfish (crustaceans in particular) are actually closely related to insects and arachnids, making up one of the main classes of the phylum Arthropoda. Cephalopods (squid, octopus, cuttlefish) and bivalves (clams, oysters) are molluscs, as are snails and slugs. I bought some mealworms at the local pet store and am getting ready to cook them. I tried removing them from their food to purge them, as suggested, but now they have started eating eachother. I stopped the purging process and put them in the freezer. Is this a common problem? It seems counter productive to purge them if they are just going to eat other worms, fewer worms and those remaining will still need purging? Hi Will, sorry to hear about that but I never saw that happen with my mealworms. How long ago did you buy them? Hi, thanks for the reply. I bought the “superworms” from petco about a week ago. I left them in the container with the pre packaged bedding / food. When I sifted out the mealworms, they started eating each other after a short time of being without food. Once I saw this I placed them in the freezer. Maybe try the normal sized ones next time. Those superworms might be a different species or forced in some way to keep growing after they should have already cocooned. Did you get around to eating them, what were they like? I finally got around to eating them. This was my first go at eating insects, so I don’t have much to compare them to. I didn”t really care for the flavor, sort of like coconut oil. I cooked them in a frying pan with butter, garlic, and onions. Well I heard superworms taste like peanuts when you bake them in the oven. I ordered some live superworms and I’m going to try them out and make a video of it later. Would they not taste better if you cooked them live? I would think that the freezing process would soften them. It might Kyle but I didn’t want to cook them while they were alive. Just something about doing that to a living creature was a little too much for me. I am raising mealworms for my chickens. I want to store them and have frozen them for 1 hour then put them in a dehydrator at 120 degrees for 2-3 hours. However most of them are turning black even though they are not dried out yet. Any thoughts why they are this color rather than golden brown? 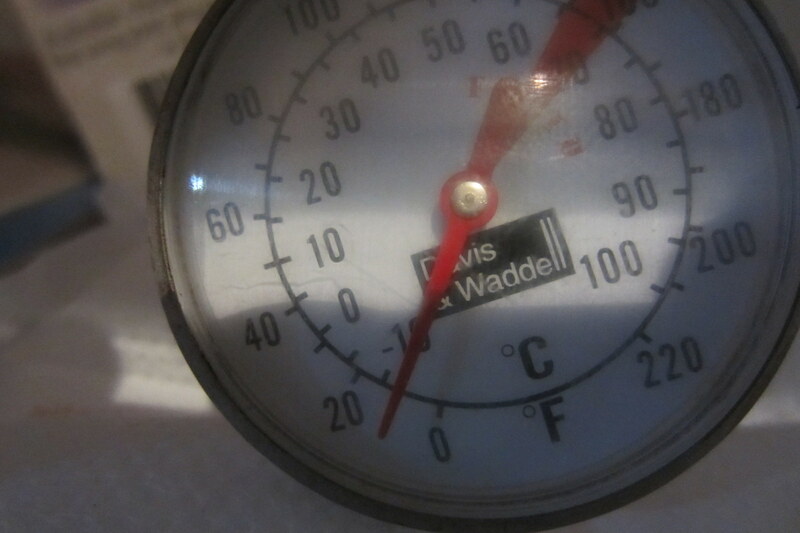 How cold is your freezer? How long do you keep them in there for? Do you cover them with a lid or open to the freezer air? Thanks for answering me re mealworms. I left them in freezer for 1-2 hours at zero degrees F. They are uncovered. 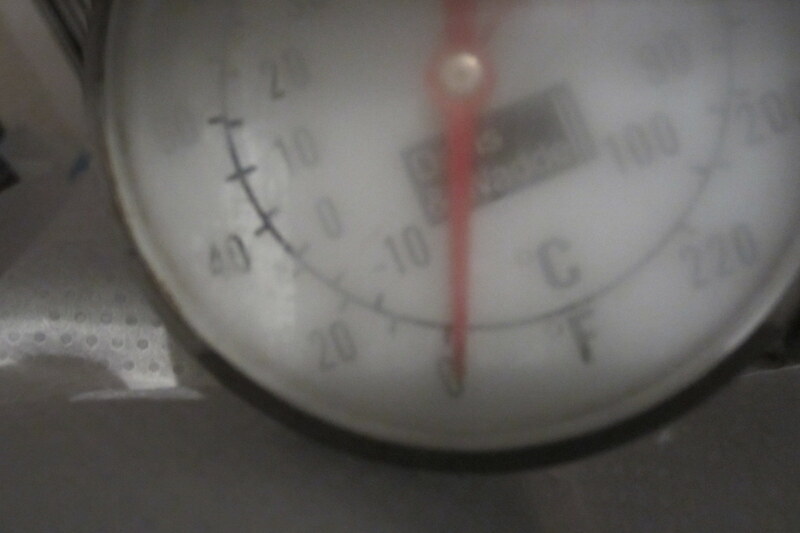 Might be getting frost damage at that temperature. Maybe try them for an hour max in there but cover them up with some cling wrap also. Please let me know how that goes. Why don’t you just grow them for the livestock? They eat the worms and you eat the chickens, kind of makes more sense than you eating them directly. Yuk Yuk. Try studying GCSE biology and learning about ‘energy transfers in ecosystems’. That, combined with the large space required to farm cows and the significant contribution to climate change is why mealworm farming is much more efficient and you should eat them directly. I just started raising my own mealworms as a cheap alternative food source. I got 100 large worms to start with and am keeping them in a ventilated container with oats and potato slices. I’ve eaten and prepared mealworms before but, now that I am raising my own, I am wondering if they are still edible when they turn to beetles? And, if so, what are some good ways to eat them? I’ve been searching online and having a hard time getting an answer. Hope somebody can help. Thanks! Hi Ty. Sorry mate but you shouldn’t eat them once they become beetles. That’s the time to keep them healthy so they lay plenty of eggs and give you more mealworms to eat. We are just getting started in raising our own mealworms. We started this mainly since we bought a leopard gecko and that is the recommended feed for them. I have to say that I’ve seen many shows about eating mealworms and I thought, “why not?” I told the wife that we may try it as well; she didnt seem to be nearly as thrilled or excited about he idea. We should have our initial shipment of 5,000 mealworms by the middle of the week. We are going to be raising them in a bed of wheat bran, with the occasional apple slice or carrot thrown in for good measure. I like the idea of crushed cinnamon stick too. Wow you are getting 5000 of them! What a way to make a start. You might find that they get through the carrot quickly so always keep them handy. Best of luck with it and I’d be very interested to hear about your experience with breeding mealworms. Thanks for recommending boiling and the purging. A lot of other recipes skip those steps, and I didn’t know that one could get sick from undercooked worms. Even though that sounds pretty bad when I say it like that. No worries Danni, happy I could help. There are those that eat them without those steps and do just fine, but better safe than sorry. Are you trying this also? Yeah, I was thinking of starting a pen to raise them in. I can’t really farm much larger things than insects at the moment. The worms themselves can get expensive if you want to buy them in bulk. Very true Danni. I have 2 pens going now and there is enough to feed my 30 odd fish in the aquaponics tank. Growing them in oats is perfect because that and the worms go into the tank by the handful. Roughly how long do you dehydrate them for? Hi Judy – about 2 hours seems to do it. Will be determined by their size, ambient temperature, how long I boil them for, and all that. Just keep an eye on them and remove when the color gets deeper and they look glazed. Yum! I must say I’m with Shelley on this even though I realize it’s silly to judge food based on appearances. BTW, did you know lobsters were considered a trash species until the early 20th century? Only the poorest of the poor would eat them before that. Just goes to show how attitudes change. Check out Nova Scotia history where they had to make it “law” that the prison inmates were not to be feed lobster more than three times a week. This is really interesting. I don’t have a problem eating mealworms as I love to eat very crisply fried tiny fish, which look very similar. I’ve also had fried grasshoppers in Japan. But I’ve never seen a recipe for cooking mealworms before. Please keep posting! Thanks mate. I’ll keep posting as I eat them – and funny you mention fried tiny fish because there is not that much difference once you get oil and salt onto them. More power to you…but something in me just recoils at the thought. I’ll never say never, though. Thanks for that Shelley – just give them a chance is all I’m asking!